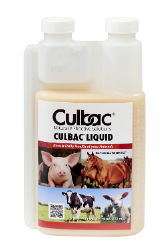 An Abiotic™ fermentation product for all livestock, is derived by culturing Lactobacillus helveticus in a nutrient medium. Contains non-viable cells. Safe for use with antibiotics and other medicated feeding programs. For maximum results feed daily. Top dress over feed or add to daily amount of fresh water, milk or milk replacer. To be fed in conjunction with normal colostrum practices. Shake Well Before Use. Store at room temperature. Poultry - 1/2 fl.oz. (15 ml)/gal. Swine - 1/2 fl.oz. (15 ml)/gal. Stressed/Performance - 1 fl.oz. (28 ml)/gal. Liquid Lactobacillus helveticus Fermentation Product, Lactic Acid.